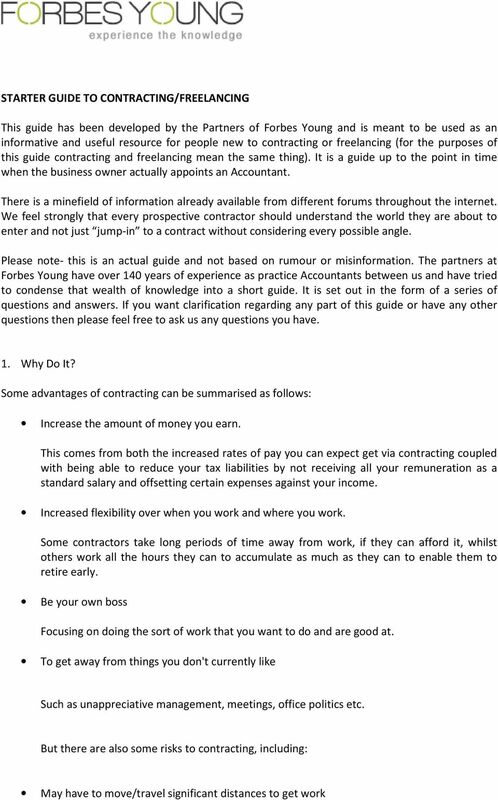 Download "STARTER GUIDE TO CONTRACTING/FREELANCING"
3 generated are automatically yours. The business of a sole trader is not distinguished from the proprietor s personal affairs so that if there are any business debts, you are legally liable to pay those debts. KEYPOINT Agencies and clients will rarely sign a contract with a sole trader because there is a significant risk that the contractor could be considered an employee of the agency or client with full employment rights. 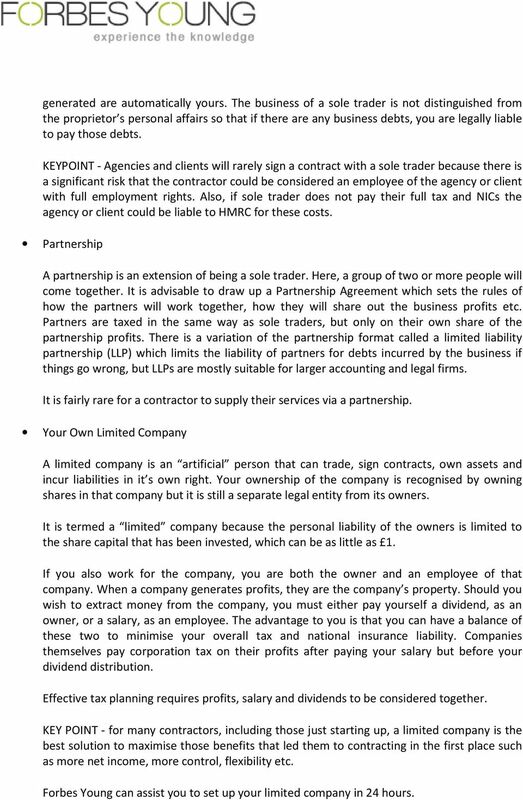 Also, if sole trader does not pay their full tax and NICs the agency or client could be liable to HMRC for these costs. Partnership A partnership is an extension of being a sole trader. Here, a group of two or more people will come together. It is advisable to draw up a Partnership Agreement which sets the rules of how the partners will work together, how they will share out the business profits etc. Partners are taxed in the same way as sole traders, but only on their own share of the partnership profits. There is a variation of the partnership format called a limited liability partnership (LLP) which limits the liability of partners for debts incurred by the business if things go wrong, but LLPs are mostly suitable for larger accounting and legal firms. It is fairly rare for a contractor to supply their services via a partnership. Your Own Limited Company A limited company is an artificial person that can trade, sign contracts, own assets and incur liabilities in it s own right. Your ownership of the company is recognised by owning shares in that company but it is still a separate legal entity from its owners. It is termed a limited company because the personal liability of the owners is limited to the share capital that has been invested, which can be as little as 1. If you also work for the company, you are both the owner and an employee of that company. When a company generates profits, they are the company s property. Should you wish to extract money from the company, you must either pay yourself a dividend, as an owner, or a salary, as an employee. The advantage to you is that you can have a balance of these two to minimise your overall tax and national insurance liability. Companies themselves pay corporation tax on their profits after paying your salary but before your dividend distribution. Effective tax planning requires profits, salary and dividends to be considered together. KEY POINT for many contractors, including those just starting up, a limited company is the best solution to maximise those benefits that led them to contracting in the first place such as more net income, more control, flexibility etc. Forbes Young can assist you to set up your limited company in 24 hours. 4 Umbrella Company Umbrella companies are limited companies operated by a specialist provider that groups a number of contractors under one company. Contractors using this structure become employees of the umbrella company and then submit regular timesheets and expenses (normally online) and then leave the rest up to the umbrella company. The umbrella company will generate and send invoices to the agency or client, chase payment when it s due and then upon receipt of payment calculate your tax and national insurance and transfer your net pay direct to your bank account. The umbrella company provider will take care of all accountancy and taxation matters and also deal with the bulk of the administration. KEYPOINT The advantage of this arrangement is that it is relatively simple from the contractor's point of view. However the downside is that your income is treated as salary which gives you a relatively high tax bill. So probably more suited to someone contracting for only a very short term or on a relatively low rate of pay or if caught by IR35 (more on this later). Offshore Company Offshore arrangements come in a variety of schemes. They seek to avoid a large chunk of UK tax being deducted from your earnings by channelling your income through a company or partnership or trust based outside the UK tax jurisdiction e.g. in the Isle of Man, Jersey etc. However, we would caution anyone thinking of using such schemes as HMRC are taking an increasingly aggressive stance towards them. Unusually, HMRC have the powers to retrospectively apply the current rules to past income. Thus you could end up being personally liable for unpaid tax, penalties and interest if a particular scheme you get involved in is subsequently investigated and falls foul of current legislation. 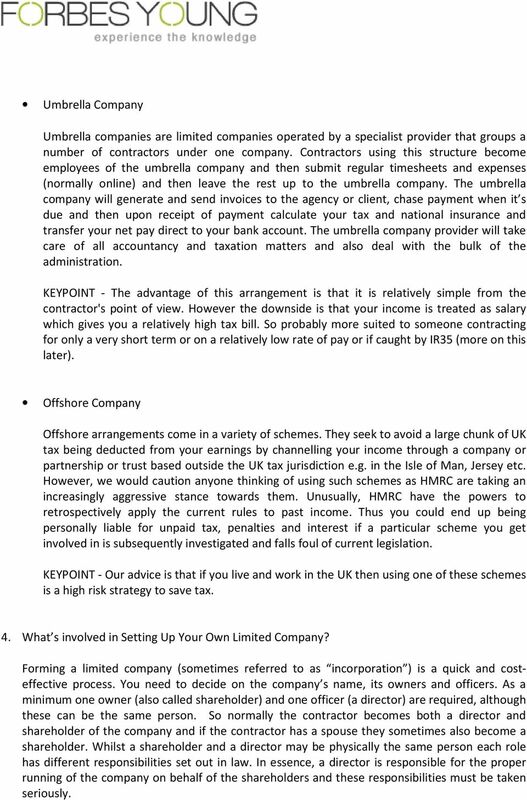 KEYPOINT Our advice is that if you live and work in the UK then using one of these schemes is a high risk strategy to save tax. 4. 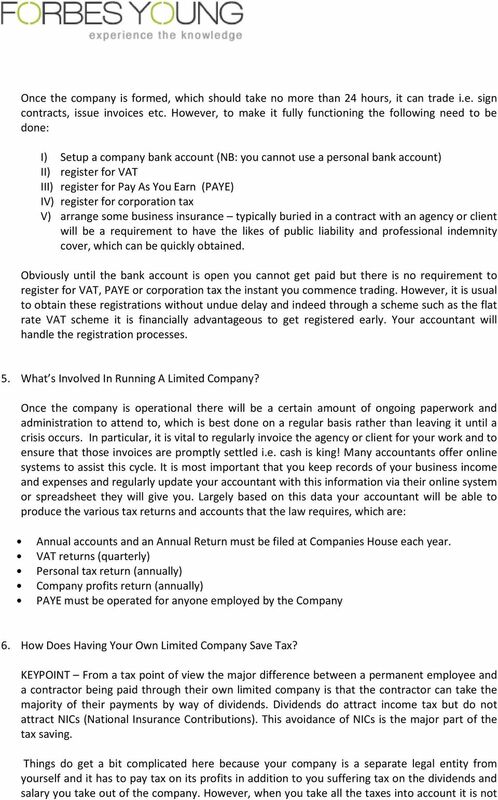 What s involved in Setting Up Your Own Limited Company? Forming a limited company (sometimes referred to as incorporation ) is a quick and costeffective process. You need to decide on the company s name, its owners and officers. As a minimum one owner (also called shareholder) and one officer (a director) are required, although these can be the same person. So normally the contractor becomes both a director and shareholder of the company and if the contractor has a spouse they sometimes also become a shareholder. Whilst a shareholder and a director may be physically the same person each role has different responsibilities set out in law. In essence, a director is responsible for the proper running of the company on behalf of the shareholders and these responsibilities must be taken seriously. 6 uncommon for a contractor to keep up to 15% more of their gross contract rate than they would do if they received the same gross rate in the form of a permanent staff member s salary. In addition, note that a limited company pays tax on profits not its gross income, which is a much more advantageous compared to the rules applying to permanent employees. Within a limited company many expenses such as travel, accountancy fees, insurances, contractors pension contribution etc. are deductible from the businesses income in arriving at the profit figure on which tax is charged. 7. What Is The Issue With IR35? 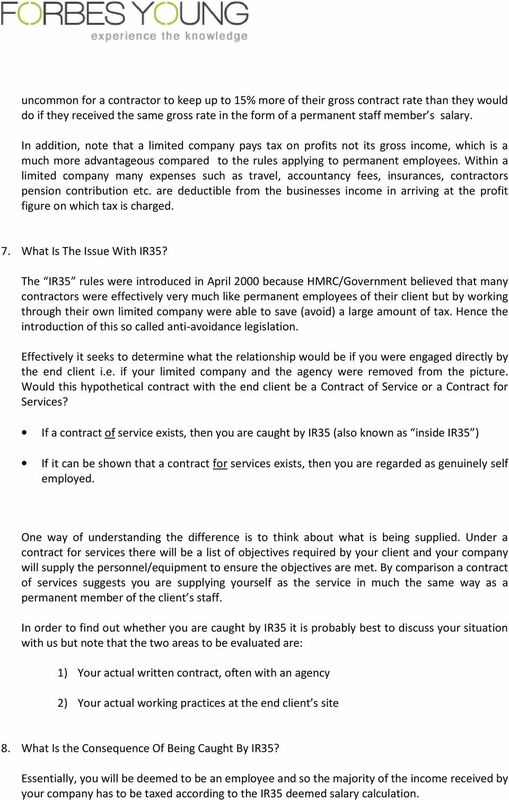 The IR35 rules were introduced in April 2000 because HMRC/Government believed that many contractors were effectively very much like permanent employees of their client but by working through their own limited company were able to save (avoid) a large amount of tax. Hence the introduction of this so called anti avoidance legislation. Effectively it seeks to determine what the relationship would be if you were engaged directly by the end client i.e. if your limited company and the agency were removed from the picture. Would this hypothetical contract with the end client be a Contract of Service or a Contract for Services? 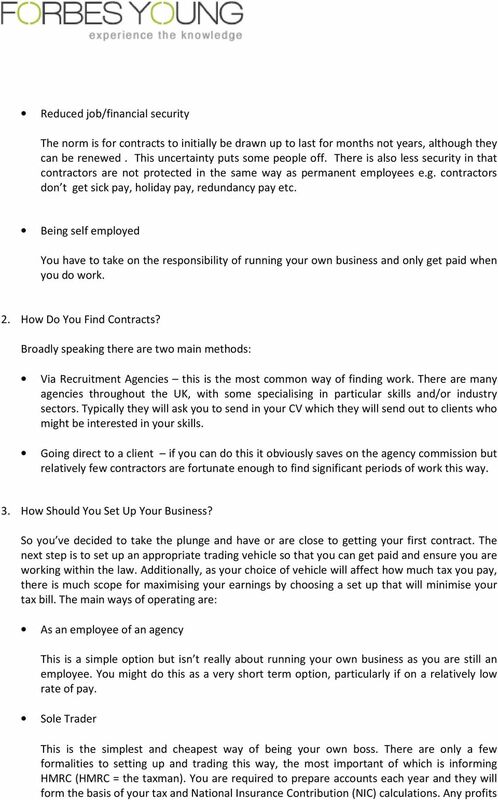 If a contract of service exists, then you are caught by IR35 (also known as inside IR35 ) If it can be shown that a contract for services exists, then you are regarded as genuinely self employed. One way of understanding the difference is to think about what is being supplied. Under a contract for services there will be a list of objectives required by your client and your company will supply the personnel/equipment to ensure the objectives are met. By comparison a contract of services suggests you are supplying yourself as the service in much the same way as a permanent member of the client s staff. In order to find out whether you are caught by IR35 it is probably best to discuss your situation with us but note that the two areas to be evaluated are: 1) Your actual written contract, often with an agency 2) Your actual working practices at the end client s site 8. What Is the Consequence Of Being Caught By IR35? Essentially, you will be deemed to be an employee and so the majority of the income received by your company has to be taxed according to the IR35 deemed salary calculation. 7 KEYPOINT This means that, whilst some allowance is given for expenses, the majority of the income received by your company is taxed as though it were salary and thus both income tax plus employees and employers NICs must be paid. So instead of taking the bulk of your payments from your company as dividends and so avoiding NICs you are forced to take them as salary and suffer NICs. 9. What Other Financial Matters Need Consideration? One important factor to note about having your own limited company is that the money coming into the company is received without any tax deductions. This is in stark contrast to a regular salary where the tax has already been deducted and you just receive a net pay. Consequently you must be disciplined and ensure that you retain enough money within your company to pay all the relevant taxes as they become due. In addition to being mindful of future tax bills, you should also consider building up a buffer of funds for a rainy day. There may be times when you want to take a break between contracts or you may be unable to immediately find a new contract or you may fall ill etc. Despite these occurrences you will still have business and personal costs to meet. 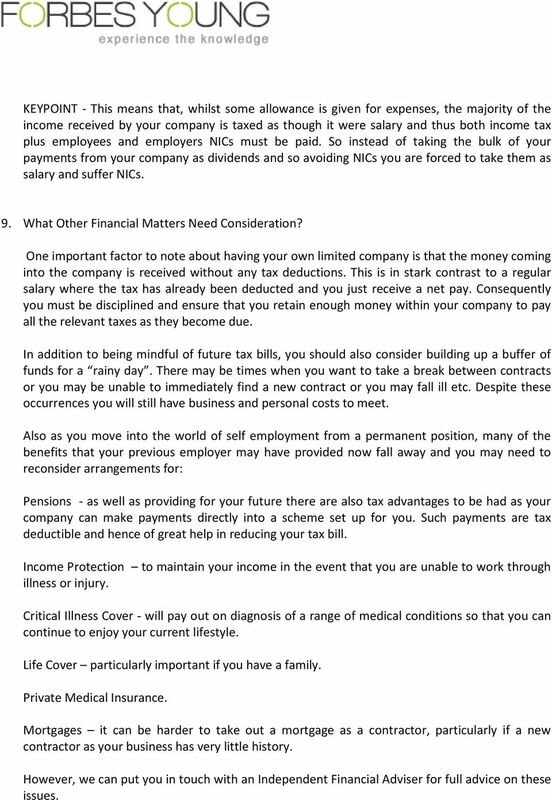 Also as you move into the world of self employment from a permanent position, many of the benefits that your previous employer may have provided now fall away and you may need to reconsider arrangements for: Pensions as well as providing for your future there are also tax advantages to be had as your company can make payments directly into a scheme set up for you. Such payments are tax deductible and hence of great help in reducing your tax bill. Income Protection to maintain your income in the event that you are unable to work through illness or injury. Critical Illness Cover will pay out on diagnosis of a range of medical conditions so that you can continue to enjoy your current lifestyle. Life Cover particularly important if you have a family. Private Medical Insurance. Mortgages it can be harder to take out a mortgage as a contractor, particularly if a new contractor as your business has very little history. However, we can put you in touch with an Independent Financial Adviser for full advice on these issues. Business Plans. Why does a business need a plan? 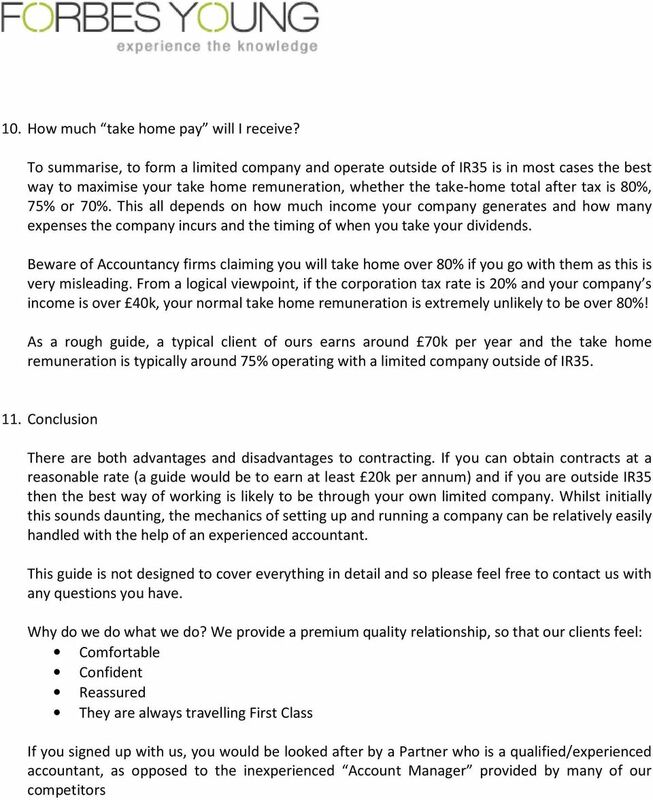 Guide to Freelancing Welcome to the IPSE Guide to Freelancing. Please bear in mind this guide is aimed at UK freelancers, so any tax issues and other legalities mentioned here are governed by British rules.